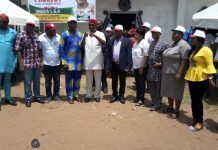 A group made up of about five men on Wednesday ‘opened’ a parallel secretariat for the main opposition party, the Peoples Democratic Party, in Abuja. The five men are Prince Obi Nwosu, Alhaji Hassan Adamu, Chief Olusola Akindele, Chief Godwin Duru and Franklyne Edede. Only two flags of the party are taped to the burglary of the building to indicate that it is a party office. The Independent National Electoral Commission recognised the national headquarters of the party is located at Wuse, Zone 5, Abuja. He said that his group was not happy with the outcome of the national convention which produced the new national officers for the party. Asked how his group emerged, he said the members were the stakeholders of the party and the defeated candidates at the convention. He, however, did not explain how he emerged as the leader of the group, but said that he was not elected. It is being speculated that the group is being sponsored by some defeated candidates at the party convention. However, one of the defeated chairmanship candidates, Prof. Tunde Adeniran, has disowned the group. 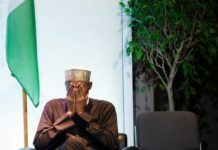 Adeniran, who spoke through the Director of his Campaign Organisation, Mr. Shehu Garban, in Abuja stated that anybody who had genuine grievances was free to express them but cautioned that his principal should not be linked to the group. Speaking on the presence of a member of his campaign team in the aggrieved group, the former minister said he did not send anyone to the group. “We do not know them. They don’t represent us and we have nothing to do with them. Whenever is there doesn’t represent us,” he added. 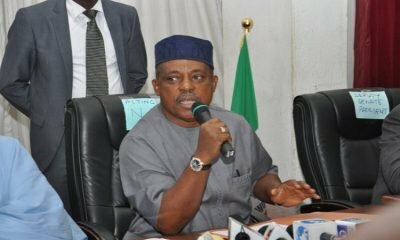 Meanwhile, the Governor of Ekiti State and the Chairman, Peoples Democratic Party’s Governors’ Forum and the National Chairman of the PDP, Uche Secondus, have said that those who have identified themselves as Fresh PDP members ought to have been arrested and jailed for disrupting the nation’s peace. 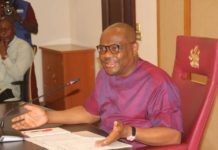 According to a statement issued by the National Publicity Secretary of the PDP, Mr. Kola Ologbondiyan, the party insisted that its house remains intact.